Tired of all the late night infommercials touting bikini clad women, and actors will full heads of hair telling you to get hair transplant tomorrow, or you’ll be doomed to a life of solitude and desperation? One of the most well known cosmetic products for dealing with hair loss has begun to infiltrate those timeslots with legitimate advertising…Its Friday night. Dinner has long passed, and your favorite hows on prime time television are just ending. You pick up the remote, and find your favorite cable show…. Battle Bots! It’s your dark, embarrassing secret, but in the late night world comprised of only you and your television, there is no shame in watching “Abbadon the Destroyer” completely annihilate “Zeus”. Soon its intermission time, and you prepare yourself for a mad dash to the kitchen so as to kill two birds with one stone: Feed your stomach, and avoid the stupid commercials. That’s when you’re presented with something you would never have expected to see: a commercial for TOPPIK. Surprised and bewildered that a legitimate hair loss product has actually hit the airwaves, you smile happily, knowing that many people will buy the stuff and love it. Okay so the story isn’t all that fictional. Nobody here at HLT is going to admit to liking Battle Bots, but we were elated when we saw our friend Mark Kress, CEO of Spencer Forrest, doing a spot for Toppik Hair Building fibers on late night television. It took all of about 10 seconds before we were on the horn asking him to tell us about this big step in the right direction. “The whole area of cosmetic products for hair loss is something we created 20 years ago, when nothing else really existed. There really was no credible way for people to hide their thinning hair with something that actually works.” Mark said. “The general reaction even now to products like ours is typically one of amusement or skepticism, thanks in large part to the high awareness of some of the older spray-on-hair products that were heavily advertised in the early 90’s”. We’ve all seen them. The infamous spray-on-hair commercials where a bald man ends up with a black cotton ball on his head in a matter of seconds, gleaming with a bright smile. As harmless as the commercials may have seemed, they made the whole notion of doing something about hair loss look that much more absurd. Toppik has poured some serious money into doing the research and creating a legitimate suite of concealer products; and with these commercials, they hope to help remold the public’s opinion. Spencer Forrest puts out three different types of concealer products. 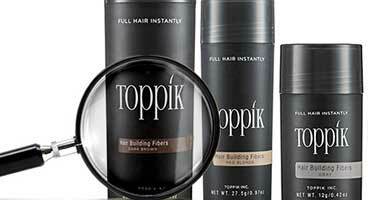 Their claim to fame, which is actually the top selling product of its type in the world, is Toppik. 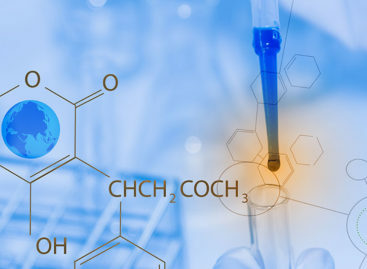 Toppik consists of tiny hair-like fibers made of actual keratin protein, the same thing human hair contains, and comes in 8 of the most common hair colors. It’s actually similar to taking tiny hairs and interspersing them with your own. This technique is actually an age-old one used by makeup artists in Hollywood in the 1950’s. The unique thing about Toppik is that they’ve actually given these hair-like fibers a static electrical charge so that when sprinkled into the hair, the fibers adhere to the person’s hair, and the appearance is instantaneously thicker. COUVRe is another cosmetic concealer product put out by Spencer Forrest which is actually intended for use directly on the scalp, and works to reduce the contrast in color between thinning hair and that glaring white skin showing through. COUVRe is a little better in rain and other higher impact activities, and both used together are a great combination. The real question is, how is it going to work for you, or if you even need it. The bottom line is, if you’ve got thinning that’s compromising your appearance, this product is for you. Several of our users have reported that before going out on a night on the town, they just sprinkle a little on, and faster than any alcohol can provide, they have instant confidence. 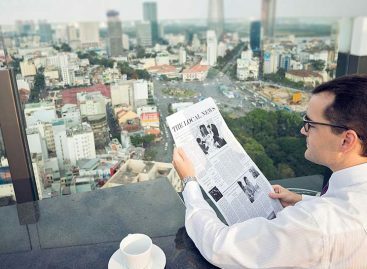 If you’re skeptical about how well it works, we encourage you to view the pictures on our product review page for Toppik. 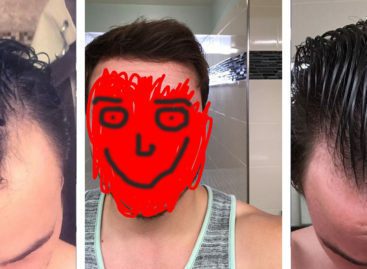 The before and after’s are pretty amazing, to say the least. We’d like to thank Mark Kress for talking with us about his products, and we hope more legit products get onto the airwaves so that the stigma attached to treating hair loss can be squelched for good. 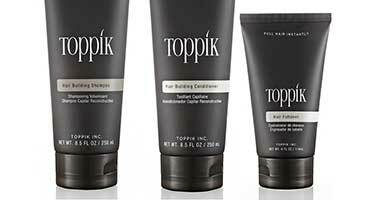 Read about Toppik and Couvre hair loss concealers and see how they can cure your hair loss in seconds. Get Toppik and Couvre hair loss concealers now and prep your appearance for that first date, or important social event.